These cards are available on our Etsy.com shoppe page, which you can easily-access by clicking on the “BRS on Etsy.com” TAB in our main menu above, or you can ALSO visit our Etsy.com shoppe right from FACEBOOK via our Etsy Tab on the BRS Facebook page (which you can also easily-access by clicking on the Facebook icon in the right sidebar). WE HOPE YOU LIKE (or maybe even LOVE) THEM! Your support and patronage mean a lot to us. We like doing things Differently and Ecologically, and We Hope You Will Join Us! [All Crafting Products used to create these cards are Archival and Acid-Free, in-short: made to LAST! Blank inside for your personal message or poem. 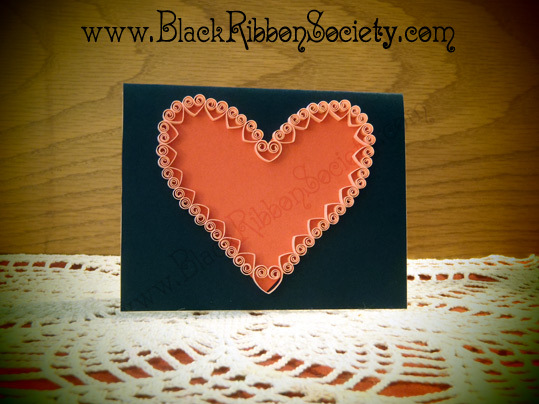 What I like best about these handmade-quilled cards is their simple-elegance. 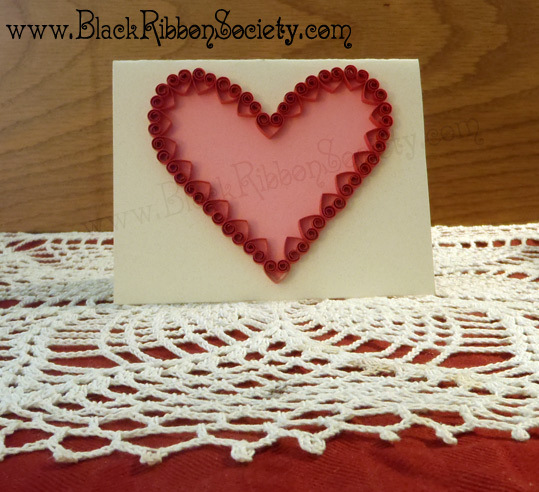 The small quilled-hearts that make up each big-heart card design remind me of the intricate-natural design of roses…you know the overlapping of the rose-petals that spiral out from the center?! 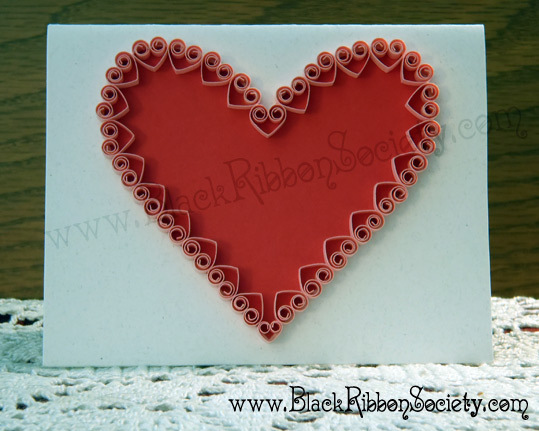 I feel that this rose-like aesthetic lends well to the Valentine’s theme, and that the 3-D sculptural aspect of quilled cards makes for a very contrasting, dynamic, and solid feel…which, to me, make these cards a superior choice for any Valentine’s Day card/gift giver! These cards will take any Valentine’s day gift up a few notches for sure, OR I am proud & confident enough to say they are substantial-enough to stand beautifully as a gift unto themselves. If you want a card that will “stick-out” for sure, these are your best bet! Each cards is unique which is befitting, because each love/relationship is unique! All paper used to make these cards was hand-cut by me, with the exception of the main “body” of the cards…each quilling paper-strip was cut, quilled, & glued one-at-a-time. The main heart shape of each card was also hand-traced and cut-out by me. Each card is made with very sturdy cardstock to guarantee stability and to be wrinkle-free. Another benefit to my application of such heavy-weight paper is that these cards have the ability to stand-up (without any aid)…so you can proudly display them anywhere! 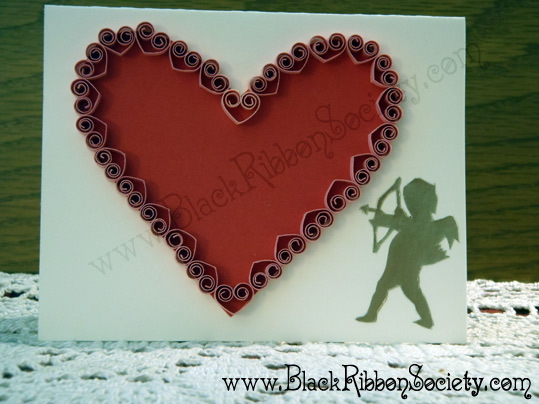 Each card is one-of-a-kind due to the size of each individual small quilled-heart, that is, the difference in sizes made the small quilled-hearts fit differently around the main big-heart design. Re-purposing NOTE: I hope that all recipients of these cards will hold on to them (as is) for years to come, but I wanted to mention that the quilled-heart design will make a great ornament…simply cut the design out from the front of the card, attach some ribbon or string and viola!, you have given the quilled-Heart a new life! How Eco and creative is that?! :^) You could even add a photo to the center if you are so-inclined. You made many valuable points at this time there. I did a glance for within the matter in addition to noticed a lot of people will concur with all your web page.